Mission Statement: The mission of St. Mary's catechist program is the education in the faith of our parish children, young people and adults which includes the teaching of the catholic doctrine. Imparted with the view to initiation the hearers into the fullness of christian life. Mission Statement: Hmong community is to support the Hmong members in St. Mary's to learn the order of the mass and communion service. Mission Statement: The Knights of Columbus provides support to the church and our Pastor. We sponsor activities to promote and support this parish, the Catholic faith and what it stands for. 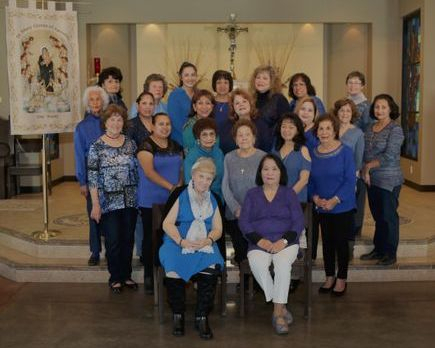 Mission Statement: To proclaim the Gospel through the use of choral and instrumental talents "sing out to those in need of healing and comfort"
Mission Statement: Nos unimos como coro para cantar en nuestra misa. Mission Statement: Our mission is to provide our Parish through financial support and to assist our pastor focusing on the beautification of the Altar and worship space to provide the necessary items for divine service. To welcome and unite all the women of the parish to join us in our ministry of service. Mission Statement: To enhance our Church Mass Celebrations with our songs and music. Mission Statement: To help our young parishioners to build their relationship with our Lord Jesus Christ. Here they learn the power of prayer and the importance of service to their church. They learn to actually talk to God and ask Him for guidance in their daily lives. They can escape the negative influences they face on a daily basis in high school. They can be themselves and feel safe to talk about their worries whether they are big or small. we are trying to plant the seed in their heart and hope to teach that love for God, family and their neighbor are important in the difficult sometimes scary world we live in. By working the the retreat they become young evangelists spreading the love God has for each and every one of us. I recently asked some of our regular attendees. "What does youth group mean to you?" words such as, "safe, trust family and home" were their responses. It is a joy to know what we are helping build our "church family"